The Solar System Contains Planets - Moons Asteroids Meteorites And Comets. Solar system houses a sun - eight planets and three dwarf planets. Our solar system comprises the Sun and the retinue of celestial objects gravitationally bound to it. In the solar system there are eight planets. These solar system planets have 162 known moons, three currently identified dwarf planets and their four known moons, and thousands of small bodies. This last category includes asteroids, meteoroids, comets, and interplanetary dust. Major features of the Solar System (not to scale): The Sun, the eight planets, the asteroid belt containing the dwarf planet Ceres, outermost there is the dwarf planet Pluto (the dwarf planet Eris not shown), and a comet. The principal component of the Solar System is the Sun or Sol (astronomical symbol ); a main sequence G2 star that contains 99.86% of the system's known mass and dominates it gravitationally. The Sun's large mass gives it an interior density high enough to sustain nuclear fusion, releasing enormous amounts of energy, most of which is radiated into space in the form of electromagnetic radiation including visible light. Jupiter and Saturn are the Sun's two largest orbiting bodiesand account for more than 90% of the system's remaining mass. (The currently hypothetical Oort cloud would also hold a substantial percentage were its existence confirmed). In broad terms, the charted regions of the Solar System consist of the Sun, four rocky bodies close to it called the terrestrial planets, an inner belt of rocky asteroids, four gas giant planets and an outer belt of small icy bodies known as the Kuiper belt. In order of their distances from the Sun, the planets are Mercury ( ), Venus ( ), Earth ( ), Mars ( ), Jupiter ( ), Saturn ( ), Uranus ( ), and Neptune ( ). All planets but two are in turn orbited by natural satellites (usually termed "moons" after Earth's Moon) and every planet past the asteroid belt is encircled by planetary rings of dust and other particles. The planets other than Earth are named after gods and goddesses from Greco-Roman mythology. From 1930 to 2006, Pluto ( ), the largest known Kuiper belt object, was considered the Solar System's ninth planet. However, in 2006 the International Astronomical Union (IAU) created an official definition of the term "planet". Under this definition, Pluto is reclassified as a Dwarf planet, and there are eight planets in the Solar System. In addition to Pluto, the IAU currently recognizes two other dwarf planets: Ceres ( ), the largest object in the asteroid belt, and Eris, which lies beyond the Kuiper belt in a region called the scattered disc. Of the known dwarf planets, only Ceres has no moons. For many years, the Solar System was the only known example of planets in orbit around a star. The discovery in recent years of many extrasolar planets has led to the term "solar system" being applied generically to all the newly discovered systems. Technically, however, it should strictly refer to Earth's system only, as the word "solar" is derived from the Sun's Latin name, Sol. Other such systems are usually referred to by the names of their parent star: "the Alpha Centauri system" or "the 51 Pegasi system". Layout and structure of the solar system. The ecliptic planets of the solar system viewed in sunlight from behind the moon in this Clementine image. From left to right: Mercury, Mars, Saturn. Most objects in orbit around the Sun lie within the ecliptic, a shallow plane which is roughly parallel to the Sun's equator. The planets are very close to the ecliptic while comets and kuiper belt objects are often at significant angles to it. 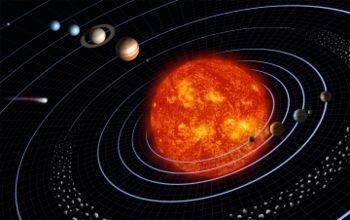 All of the planets (and most other objects) also orbit with the Sun's rotation; in a counter-clockwise direction as viewed from a point above the Sun's north pole. There is a direct relationship between how far away a planet is from the Sun and how quickly it orbits. Mercury, the closest to the sun, travels the fastest, while Neptune, being much farther from the Sun, travels more slowly. Objects orbit in an ellipse around the Sun, so an orbiting object's distance from the Sun varies in the course of its year. 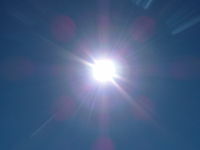 Its closest approach to the Sun is known as its perihelion while its farthest point from the Sun is called its aphelion. Although the orbits of the planets are nearly circular (with perihelions roughly equal to their aphelions), many comets, asteroids and objects of the Kuiper belt follow highly elliptical orbits with large differences between perihelion and aphelion. The paths of objects around the Sun travel according to a law of planetary motion discovered by German astronomer Johannes Kepler in the early 1600's. The sun is slightly off to the side of the center of each ellipse at a point called a focus. The focus is actually a point just outside the centre of the Sun called the barycenter of the solar system. Astronomers most often measure distances within the solar system in astronomical units or AU. One AU is the average distance between the Earth and the Sun or roughly 149 598 000 km (93,000,000 mi). Pluto is roughly 39 AU from the Sun while Jupiter lies at roughly 5.2 AU. Informally, the Solar System is sometimes divided into separate "zones"; the first zone, known as the inner Solar System, comprises the inner planets and the main asteroid belt. The outer solar system is sometimes defined as everything beyond the asteroids; however it is also the name often given to the region beyond Neptune with the gas giants as a separate "middle zone." The orbits of the bodies in the solar system to scale (clockwise from top left). One common misconception is that the orbits of the major objects within the Solar System (planets, Pluto and asteroids) are equidistant. To cope with the vast distances involved, many representations of the Solar System simplify these orbits by showing them the same distance apart. However, in reality, with a few exceptions, the Solar System is arranged so that the farther a planet or belt is from the Sun, the larger the distance between it and the previous orbit. For example, Venus is approximately 0.33 AU farther out than Mercury while Jupiter is 1.9 AU from the farthest extent of the asteroid belt and Neptune's orbit is roughly 20 AU farther out than that of Uranus. Attempts have been made to determine a correlation between these distances (see Bode's Law) but to date there is no accepted theory that explains the orbital distances. Planets, dwarf planets, and small solar system bodies. Planet, dwarf planet, and small solar system body. 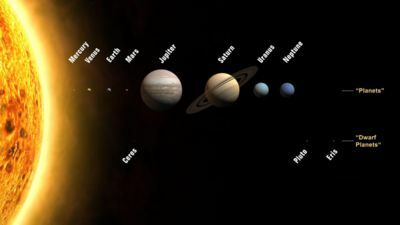 In a decision passed by the International Astronomical Union General Assembly on August 24, 2006, the objects in the Solar System other than the Sun and natural satellites were divided into three separate groups: planets, dwarf planets and small solar system bodies. Planets and Dwarf Planets of the solar system. While the size is to scale, the relative distances from the Sun are not. Under this classification, a planet is any body in orbit around the Sun that a) has enough mass to form itself into a spherical shape and b) has cleared its immediate neighborhood of all smaller objects. Eight objects in the Solar System currently meet this definition; they are Mercury, Venus, Earth, Mars, Jupiter, Saturn, Uranus, and Neptune. Dwarf planet was a second and new classification. The key difference between planets and dwarf planets is that while both are required to orbit the Sun and be of large enough mass that their own gravity pulls them into a nearly round shape, dwarf planets are not required to clear their neighborhood of other celestial bodies. Three objects in the solar system are currently included in this category; they are Pluto (formerly considered a planet), the asteroid Ceres, and the scattered disc object Eris. The IAU will begin evaluating other known objects to see if they fit within the definition of dwarf planets. The most likely candidates are some of the larger asteroids and several Trans-Neptunian Objects such as Sedna, Orcus, and Quaoar. Formation and evolution of the solar system and Solar nebula. The current hypothesis of Solar System formation is the nebular hypothesis, first proposed in 1755 by Immanuel Kant and independently formulated by Pierre-Simon Laplace. The nebular theory holds that the Solar System was formed from the gravitational collapse of a gaseous cloud called the Solar nebula. It had a diameter of 100 AU and was 2-3 times the mass of the Sun. Over time, a disturbance (possibly a nearby supernova) squeezed the nebula, pushing matter inward until gravitational forces overcame the internal gas pressure and it began to collapse. As the nebula collapsed, conservation of angular momentum meant that it spun faster, and became warmer. As the competing forces associated with gravity, gas pressure, magnetic fields, and rotation acted on it, the contracting nebula began to flatten into a spinning protoplanetary disk with a gradually contracting protostar at the center. Studies of young, pre-fusing solar mass stars, called T Tauri stars, show that these discs extend to several hundred AU and are rather cool, reaching only a thousand kelvins at their hottest. From this cloud and its gas and dust, the various planets formed. The currently accepted method by which the planets formed is known as accretion, in which the planets began as dust grains in orbit around the central protostar, which initially formed by direct contact into clumps between one and ten kilometres in diameter, which in turn collided to form larger bodies (planetesimals), of roughly 5 km in size gradually increasing by further collisions by roughly 15 cm per year over the course of the next few million years. Farther out still, beyond the frost line, where lighter and more volatile compounds could remain solid, Jupiter and Saturn were able to gather more material than the terrestrial planets, as those compounds were more common. They became the gas giants, while Uranus and Neptune captured much less material and are known as ice giants because their cores are believed to be made mostly of ices (hydrogen compounds). The Sun as seen from Earth. The Hertzsprung-Russell diagram. The main sequence is from bottom right to top left. The Sun is the Solar System's parent star, and far and away its chief component. It is classed as a moderately large yellow dwarf. However, this name is misleading, as on the scale of stars in our galaxy, the Sun is rather large and bright. Stars are classified based on their position on the Hertzsprung-Russell diagram, a graph which plots the brightness of stars against their surface temperatures. Generally speaking, the hotter a star is, the brighter it is. Stars which follow this pattern are said to be on the main sequence, and the Sun lies right in the middle of it. This has led many astronomy textbooks to label the Sun as "average;" however, stars brighter and hotter than it are rare, whereas stars dimmer and cooler than it are common. The vast majority of stars are dim red dwarfs, though they are under-represented in star catalogues as we can observe only those few that are very near the Sun in space. The Sun's position on the main sequence means, according to current theories of stellar evolution, that it is in the "prime of life" for a star, in that it has not yet exhausted its store of hydrogen for nuclear fusion, and been forced, as older red giants must, to fuse more inefficient elements such as helium and carbon. The Sun is growing increasingly bright as it ages. Early in its history, it was roughly 75 percent as bright as it is today. Calculations of the ratios of hydrogen and helium within the Sun suggest it is roughly halfway through its life cycle, and will eventually begin moving off the main sequence, becoming larger, brighter and redder, until, about five billion years from now, it too will become a red giant. The Sun is a population I star, meaning that it is fairly new in galactic terms, having been born in the later stages of the universe's evolution. As such, it contains more elements heavier than hydrogen and helium ("metals" in astronomical parlance) than older Population II stars such as those found in globular clusters. Since elements heavier than hydrogen and helium were formed in the cores of ancient and exploding stars, the first generation of stars had to die before the universe could be enriched with them. For this reason, the very oldest stars contain very few metals, while stars born later have more. This high metallicity is thought to have been crucial in the Sun's developing a planetary system, because planets form from accretion of metals. The Sun radiates a continuous stream of charged particles, a plasma known as solar wind, ejecting it outwards at speeds greater than 2 million kilometres per hour, creating a very tenuous "atmosphere" (the heliosphere), that permeates the solar system for at least 100 AU. This environment is known as the interplanetary medium. Small quantities of cosmic dust (some of it arguably interstellar in origin) are also present in the interplanetary medium and are responsible for the phenomenon of zodiacal light. 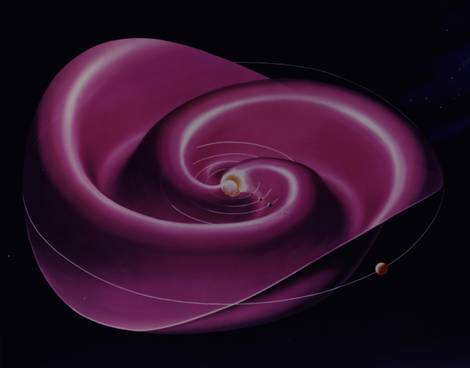 The influence of the Sun's rotating magnetic field on the interplanetary medium creates the largest structure in the solar system, the heliospheric current sheet. Earth's magnetic field protects its atmosphere from interacting with the solar wind. However, Venus and Mars do not have magnetic fields, and the solar wind causes their atmospheres to gradually bleed away into space. The four inner or terrestrial planets are characterised by their dense, rocky composition, few or no moons, and lack of ring systems. They are composed largely of minerals with high melting points such as silicates to form the planets' solid crusts and semi-liquid mantles, and metals such as iron and nickel, which form their cores. Three of the four inner planets have substantial atmospheres. All have impact craters and possess tectonic surface features, such as rift valleys and volcanoes. The term inner planet should not be confused with inferior planet, which designates those planets which are closer to the Sun than the Earth is (i.e. Mercury and Venus). The inner planets of the solar system. From left to right: Mercury, Venus, Earth, and Mars (sizes to scale). Mercury (0.4 AU), the closest planet to the Sun, is also the least massive of the planets, at only 0.055 Earth masses. Mercury has a very thin atmosphere consisting of atoms blasted off its surface by the solar wind. Because Mercury is so hot, these atoms quickly escape into space. Thus in contrast to the Earth and Venus whose atmospheres are stable, Mercury's atmosphere is constantly being replenished. It has no natural satellite, and it's only known geological features besides impact craters are "wrinkle ridges" probably produced by a period of contraction early in its history. Its relatively large iron core and thin mantle have not yet been adequately explained. Hypotheses include that its outer layers were stripped off by a giant impact, and that it was prevented from fully accreting by the Sun's gravity. Venus (0.7 AU) is of comparable mass to the Earth (0.815 Earth masses), and, like Earth, possesses a thick silicate mantle around an iron core, as well as a substantial atmosphere and evidence of internal geological activity, such as volcanoes. However, it is much drier than Earth and its atmosphere is 90 times as dense and is composed overwhelmingly (96.5%) of carbon dioxide. Venus has no natural satellite. It is the hottest planet, despite being farther from the sun than Mercury, with temperatures reaching more than 400 degrees Celsius. This is most likely because of the amount of greenhouse gases in the atmosphere. Although no definitive evidence of geological activity has yet been detected on Venus, its substantial atmosphere and lack of a magnetic field to protect it from depletion by the solar wind suggest that it must be regularly replenished by volcanic eruptions, perhaps as massive, global volcanic events which resurface the entire planet at a stroke, though other studies have shown that these events may have been continuous rather than instantaneous. The largest and densest of the inner planets, Earth (1 AU) is also the only one to demonstrate unequivocal evidence of current geological activity. Earth is the only planet known to have life. Its liquid hydrosphere, unique among the terrestrial planets, is probably the reason Earth is also the only planet where plate tectonics has been observed, because water acts as a lubricant for subduction. Its atmosphere is radically different from the other terrestrial planets, having been altered by the presence of life to contain 21 percent free oxygen. It has one satellite, the Moon; the only large satellite of a terrestrial planet in the Solar System. In fact, the Moon is in co-orbit around the Sun with the Earth; its annual orbit around the Sun is essentially circular. The Moon possesses many features in common with other terrestrial planets, though differs in that its core is much smaller. Mars (1.5 AU), at only 0.107 Earth masses, is less massive than either Earth or Venus. It possesses a tenuous atmosphere of carbon dioxide. Its surface, peppered with vast volcanoes and rift valleys such as Valles Marineris, shows that it was once geologically active and recent evidence suggests this may have been true until very recently. Mars possesses two tiny moons (Deimos and Phobos) thought to be captured asteroids. Solar system image of the main asteroid belt and the Trojan asteroids. asteroids are mostly small solar system bodies that are composed in significant part of rocky and metallic non-volatile minerals. The main asteroid belt occupies the orbit between Mars and Jupiter, between 2.3 and 3.3 AU from the Sun. It is thought to be the remnants from the Solar System's formation that failed to coalesce because of the gravitational interference of Jupiter. Asteroids range in size from hundreds of kilometers to as small as dust. All asteroids save the largest, Ceres, are classified as small solar system bodies; however, a number of other asteroids, such as Vesta and Hygeia, could potentially be reclassed as dwarf planets if it can be conclusively shown that they are spherical. The asteroid belt contains tens of thousands - and potentially millions - of objects over one kilometre in diameter. However, despite their large numbers, the total mass of the main belt is unlikely to be more than a thousandth of that of the Earth. In contrast to its various depictions in science fiction, the main belt is very sparsely populated; spacecraft routinely pass through without incident. Asteroids with a diameter of less than 50 m are called meteoroids. Ceres (2.77 AU) is the largest astronomical body in the asteroid belt and the only known Dwarf planet in this region. It has a diameter of slightly under 1000 km, large enough for its own gravity to pull it into a spherical shape. Ceres was considered a planet when it was discovered in the nineteenth century, but was reclassified as an asteroid as further observation revealed additional asteroids. It has since been again reclassified as a dwarf planet. Asteroid groups in the solar system. Asteroids in the main belt are subdivided into asteroid groups and families based on their specific orbital characteristics. Asteroid moons are asteroids that orbit larger asteroids. They are not as clearly distinguished as planetary moons, sometimes being almost as large as their partners. The asteroid belt also contains main-belt comets which may have been the source of Earth's water. Trojan asteroids are located in either of Jupiter's L4 or L5 points, (gravitationally stable regions leading and trailing a planet in its orbit) though the term is also sometimes used for asteroids in any other planetary Lagrange point as well. Hilda asteroids are those Trojans whose orbits are in a 2:3 resonance with Jupiter; that is, they go around the Sun three times for every two Jupiter orbits. Outer planets of the solar system including gas giants. 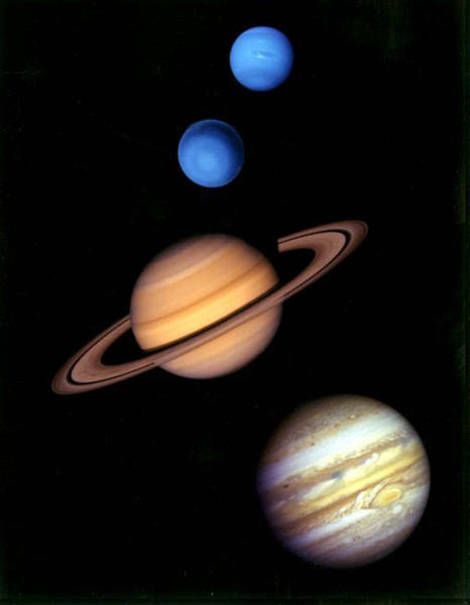 The outer planets of the solar system: From top to bottom: Neptune, Uranus, Saturn, and Jupiter (sizes not to scale). The four outer planets, or gas giants, (sometimes called Jovian planets) are so large they collectively make up 99 percent of the mass known to orbit the Sun. Jupiter and Saturn are true giants, at 318 and 95 Earth masses, respectively, and composed largely of hydrogen and helium. Uranus and Neptune are both substantially smaller, being only 14 and 17 Earth masses, respectively. Their atmospheres contain a smaller percentage of hydrogen and helium, and a higher percentage of "ices", such as water, ammonia and methane. For this reason some astronomers suggested that they belong in their own category, "Uranian planets," or "ice giants." All four of the gas giants exhibit orbital debris rings, although only the ring system of Saturn is easily observable from Earth. The term outer planet should not be confused with superior planet, which designates those planets which lie outside Earth's orbit (thus consisting of the outer planets plus Mars). Jupiter (5.2 AU), at 318 Earth masses, is 2.5 times the mass of all the other planets put together. Its composition of largely Hydrogen and helium is not very different from that of the Sun, and the planet has been described as a "failed star". Jupiter's strong internal heat creates a number of semi-permanent features in its atmosphere, such as cloud bands and the Great Red Spot. The four largest of its 63 Satellites, Ganymede, Callisto, Io, and Europa (the Galilean satellites) share elements in common with the terrestrial planets, such as volcanism and internal heating. Ganymede, the largest satellite in the Solar System, has a diameter larger than Mercury. Saturn (9.5 AU), famous for its extensive ring system, has many qualities in common with Jupiter, including its atmospheric composition, though it is far less massive, being only 95 Earth masses. Two of its 56 moons, Titan and Enceladus, show signs of geological activity, though they are largely made of ice. Titan, like Ganymede, is larger than Mercury; it is also the only satellite in the solar system with a substantial atmosphere, similar in composition to that of the atmosphere of the early Earth. Uranus (19.6 AU) at 14 Earth masses, is the lightest of the outer planets. Uniquely among the planets, it orbits the Sun on its side; its axial tilt lies at over ninety degrees to the ecliptic. Its core is remarkably cold compared with the other gas giants, and radiates very little heat into space. Uranus has 27 satellites, the largest being Titania, Oberon, Umbriel, Ariel and Miranda. Neptune (30 AU), though slightly smaller than Uranus, is denser and slightly more massive, at 17 Earth masses, and radiates more internal heat than Uranus, but not as much as Jupiter or Saturn. Its peculiar ring system is composed of a number of dense "arcs" of material separated by gaps. Neptune has 13 moons. The largest, Triton, is geologically active, with geysers of liquid nitrogen, and is the only large satellite to revolve around its host planet in a prograde (clockwise) motion. Neptune possesses a number of Trojan asteroids. 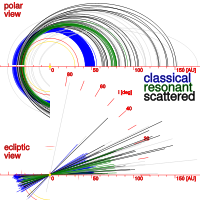 Diagram showing the resonant and classical Kuiper belt. The area beyond Neptune, often referred to as the outer solar system or simply the "trans-Neptunian region", is still largely unexplored. This region's first formation is the Kuiper belt, a great ring of debris, similar to the asteroid belt but composed mainly of ice and far greater in extent, which lies between 30 and 50 AU from the Sun. This region is thought to be the place of origin for short-period comets, such as Halley's comet. Though it is composed mainly of small solar system bodies, many of the largest Kuiper belt objects could soon be reclassified as dwarf planets. There are estimated to be over 100,000 Kuiper Belt objects with a diameter greater than 50 km; however, the total mass of the Kuiper belt is relatively low, perhaps barely equalling the mass of the Earth. 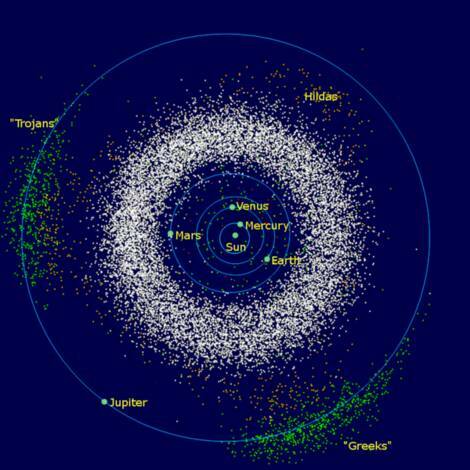 Many Kuiper belt objects have multiple satellites and most have orbits that take them outside the plane of the ecliptic. The Kuiper belt can be roughly divided into two regions: the "resonant" belt, consisting of objects whose orbits are in some way linked to that of Neptune (orbiting, for instance, three times for every two Neptune orbits, or twice for every one), which actually begins within the orbit of Neptune itself, and the "classical" belt, consisting of objects that don't have any resonance with Neptune, and which extends from roughly 39.4 AU to 47.7 AU. Members of the classical Kuiper belt are classified as Cubewanos, after the first of their kind to be discovered, 1992 QB1. Pluto and Charon in the solar system. Pluto, and its three known moons. Pluto (39 AU average), is the largest known object in the Kuiper belt and was previously accepted as the smallest planet in the Solar System. In 2006, it was reclassified as a Dwarf planet by the Astronomers Congress organized by the International Astronomers Union (IAU). Pluto has a relatively eccentric orbit inclined 17 degrees to the ecliptic plane and ranging from 29.7 AU from the Sun at perihelion (within the orbit of Neptune) to 49.5 AU at aphelion. Prior to the 2006 redefinitions, Charon was considered a moon of Pluto, but in light of the redefinition it is unclear whether Charon will continue to be classified as a moon of Pluto or as a dwarf planet itself. Charon does not exactly orbit Pluto in a traditional sense; Charon is about one-tenth the mass of Pluto and the center of gravity of the pair is not within Pluto. Both bodies orbit a barycenter of gravity above the surface of Pluto (in empty space), making Pluto-Charon a binary system. 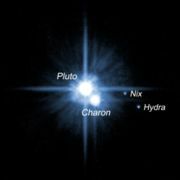 Two much smaller moons, Nix and Hydra, orbit Pluto and Charon. Those Kuiper belt objects which, like Pluto, possess a 3:2 orbital resonance with Neptune (ie, they orbit twice for every three Neptunian orbits) are called Plutinos. Scattered disc of the solar system. 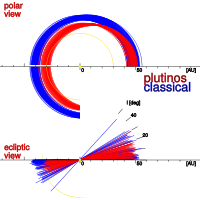 Black: scattered disc; blue: classical Kuiper belt; green: resonant KBOs inc. Pluto. Overlapping the Kuiper belt but extending much further outwards is the scattered disc. Scattered disc objects are believed to have been originally native to the Kuiper belt, but were ejected into erratic orbits in the outer fringes by the gravitational influence of Neptune's outward migration (see Formation and evolution of the Solar System). Most scattered disc objects have perihelia within the Kuiper belt but aphelia as far as 150 AU from the Sun. Their orbits are also highly inclined to the ecliptic plane, and are often almost perpendicular to it. Some astronomers, such as Kuiper belt co-discoverer David Jewitt, consider the scattered disc to be merely another region of the Kuiper belt, and describe scattered disc objects as "scattered Kuiper belt objects." Eris in the solar system. Solar system Eris and its moon Dysnomia. Eris (68 AU average) is the largest known scattered disc object and was the cause of the most recent debate about what constitutes a planet since it is at least 5% larger than Pluto with an estimated diameter of 2400 km (1500 mi). It is now the largest of the known dwarf planets. It has one moon, Dysnomia. The object has many similarities with Pluto: its orbit is highly eccentric, with a perihelion of 38.2 AU (roughly Pluto's distance from the Sun) and an aphelion of 97.6 AU, and is steeply inclined to the ecliptic plane, at 44 degrees, more so than any known object in the solar system except the newly-discovered object 2004 XR190 (also known as "Buffy") and is believed to consist largely of rock and ice. Comets orbiting the solar system. comets are small solar system bodies (usually only a few kilometres across) composed largely of volatile ices, which possess highly eccentric orbits, generally having a perihelion within the orbit of the inner planets and an aphelion far beyond Pluto. When a comet approaches the Sun, its icy surface begins to sublimate, or boil away, creating a coma; a long tail of gas and dust which is often visible with the naked eye. There are two basic types of comet: short-period comets, with orbits less than 200 years, and long-period comets, with orbits lasting thousands of years. 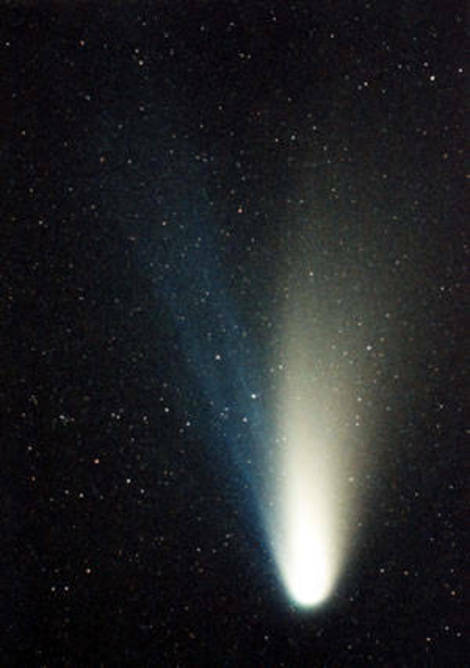 Short-period comets, such as Halley's comet, are believed to originate in the Kuiper belt, while long period comets, such as Hale-Bopp (pictured), are believed to originate in the Oort cloud. Some comets with hyperbolic orbits may originate outside the solar system. Old comets that have had most of their volatiles driven out by solar warming are often categorized as asteroids. Centaurs are icy comet-like bodies that have less-eccentric orbits so that they remain in the region between Jupiter and Neptune. The largest known Centaur, 10199 Chariklo, has a diameter of between 200 and 250 km. The first centaur to be discovered, 2060 Chiron, has been called a comet since it has been shown to develop a coma just as comets do when they approach the sun. Farthest regions of the solar system. The point at which the solar system ends and interstellar space begins is not precisely defined, since its outer boundaries are delineated by two separate forces: the solar wind and the Sun's gravity. The solar wind extends to a point roughly 130 AU from the Sun, whereupon it surrenders to the surrounding environment of the interstellar medium. The Sun's gravity, however, holds sway to almost halfway to the next star system. The vast majority of the solar system, therefore, is completely unknown; however, recent observations of both the solar system and other star systems have led to an increased understanding of what is or may be lying at its outer edge. An artist's impression of Sedna. The Voyagers entering the heliosheath. 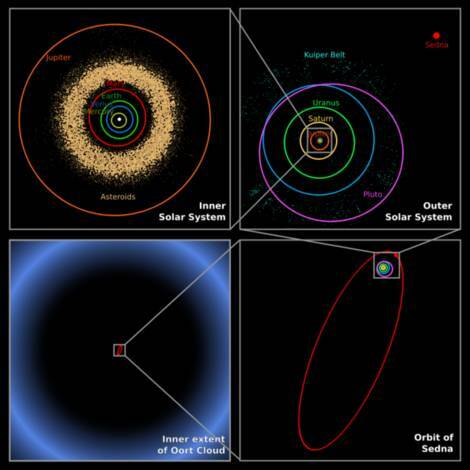 Artist's rendering of the Kuiper Belt and hypothetical Oort cloud. artist's impression of the Local Bubble. Presumed location of the solar system within our galaxy. The heliosphere expands outward in a great bubble to about 95 AU, or three times the orbit of Pluto. The edge of this bubble is known as the Termination Shock; the point at which the solar wind collides with the opposing winds of the interstellar medium. Here the wind slows, condenses and becomes more turbulent, forming a great oval structure known as the Heliosheath that looks and behaves very much like a comet's tail; extending outward for a further 40 AU at its stellar-windward side, but tailing many times that distance in the opposite direction. 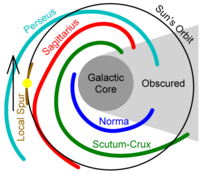 The outer boundary of the sheath, the Heliopause, is the point at which the solar wind finally terminates, and one enters the environment of interstellar space. Beyond the heliopause, at around 230 AU, lies the bow shock, a plasma "wake" left by the Sun as it travels through the Milky Way. Sedna in the solar system. Sedna is a large, reddish Pluto-like object with a gigantic, highly elliptical orbit that takes it from about 76 AU at perihelion to 928 AU at aphelion and takes 12,050 years to complete. Mike Brown, who discovered the object in 2003, asserts that it cannot be part of the scattered disc or the Kuiper belt as it has too distant a perihelion to have been affected by Neptune's migration. He and other astronomers consider it to be the first in an entirely new population, one which also may include the object 2000 CR105, which has a perihelion of 45 AU, an aphelion of 415 AU, and an orbital period of 3420 years. Sedna is very likely a dwarf planet, though its shape has yet to be determined with certainty. The solar system's Oort cloud. 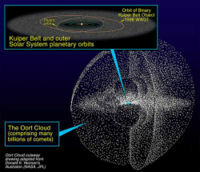 The Oort cloud, currently only hypothetical, is a great mass of up to a trillion icy objects that is believed to be the source for all long-period comets and to surround the solar system like a shell from 50,000 to 100,000 AU beyond the Sun. It is believed to be composed of comets which where ejected from the inward Solar System by gravitational interactions with the outer planets. Because the Sun's gravitational hold on them is so weak, Oort cloud objects move only very slowly, though they can be perturbed by such rare events as collisions, or the gravitational effects of a passing star or the galactic tides. The solar system is located in the Milky Way Galaxy, a Barred spiral galaxy with a diameter estimated at about 100,000 light years containing approximately 200 billion stars. Our Sun resides in one of the Milky Way's outer spiral arms, known as the Orion Arm or Local Spur. 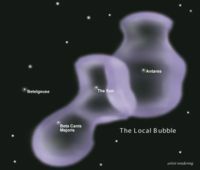 The immediate galactic neighborhood of the solar system is known as the Local Fluff, an area of dense cloud in an otherwise sparse region known as the Local Bubble, an hourglass-shaped cavity in the interstellar medium roughly 300 light-years across. The bubble is suffused with high-temperature plasma that suggests it is the product of several recent supernovae. Estimates place the solar system at between 25,000 and 28,000 light years from the Galactic center. Its speed is about 220 kilometres per second, and it completes one revolution every 226 million years. The apex of solar motion--that is, the direction in which the Sun is heading--is near the current location of the bright star Vega. At the galactic location of the solar system, the escape velocity with regard to the gravity of the Milky Way is about 1000 km/s. The solar system appears to have a very remarkable orbit. It is both extremely close to being circular, and at nearly the exact distance at which the orbital speed matches the speed of the compression waves that form the spiral arms. The solar system appears to have remained between spiral arms for most of the existence of life on Earth. The radiation from supernovae in spiral arms could theoretically sterilize planetary surfaces, preventing the formation of large animal life on land. By remaining out of the spiral arms, Earth may be unusually free to form large animal life on its surface. 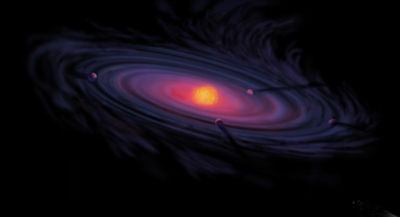 The solar system also lies well outside the star-crowded environs of the galactic centre. The opposing gravitational tugs from so many close stars within the galactic centre would have prevented planets from forming. Recent studies of Extrasolar systems neighboring Earth's have shown that our system's configuration might not be common, as the vast majority so far discovered have been found to be markedly different. For instance, many extrasolar planetary systems contain a "hot Jupiter"; a planet of comparable size to Jupiter that nonetheless orbits very close to its star, at, for instance, 0.05 AU. It has been hypothesised that while the giant planets in these systems formed in the same place as the gas giants in Earth's solar system did, some sort of migration took place which resulted in the giant planet spiralling in towards the parent star. Any terrestrial planets which had previously existed would presumably either be destroyed or ejected from the system. On the other hand, the apparent prevalence of hot Jupiters could result from a sampling error, as planets of similar size at greater distances from their stars are more difficult to detect. Discovery and exploration of the solar system: Geocentric model, Heliocentrism. For many thousands of years, people, with a few notable exceptions, did not believe the solar system existed. The Earth was believed not only to be stationary at the centre of the universe, but to be categorically different from the divine or ethereal objects that moved through the sky. The conceptual advances of the 17th century, led by Nicolaus Copernicus, Galileo Galilei, Johannes Kepler, and Isaac Newton, led gradually to the acceptance of the idea not only that Earth moved round the Sun, but that the planets were governed by the same laws that governed the Earth, and therefore could be similar to it. 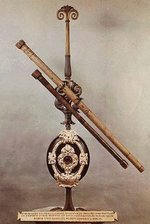 Telescopic observations of solar system. The first exploration of the solar system was conducted by telescope, with astronomers learning that the Moon and other planets possessed such Earthlike features as craters, ice caps, and seasons. Galileo Galilei was the first to discover physical details about the individual bodies of the Solar System. He discovered that the Moon was cratered, that the Sun was marked with sunspots, and that Jupiter had four satellites in orbit around it. Christiaan Huygens followed on from Galileo's discoveries by discovering Saturn's moon Titan and the shape of the Rings of Saturn. Giovanni Domenico Cassini later discovered four more moons of Saturn, the Cassini division in Saturn's rings, and the Great Red Spot of Jupiter. In 1682, Edmund Halley realised that repeated sightings of a comet were in fact recording the same object, returning regularly once every 75-6 years. This proved once and for all that comets were not atmospheric phenomena, as had been previously thought, and was the first evidence that anything other than the planets orbited the Sun. In 1781, William Herschel was looking for binary stars in the constellation of Taurus when he observed what he thought was a new comet. In fact, its orbit revealed that it was a new planet, Uranus, the first ever discovered. In 1801, Giuseppe Piazzi discoverd Ceres, a small world between Mars and Jupiter that was initially considered a new planet. However, subsequent discoveries of thousands of other small worlds in the same region led to their eventual separate reclassification: asteroids. In 1846, discrepancies in the orbit of Uranus led many to suspect a large planet must be tugging at it from farther out. Urbain Le Verrier's calculations eventually led to the discovery of Neptune. Further discrepancies in the orbits of the planets led Percival Lowell to conclude yet another planet, "Planet X" must still be out there. After his death, his Lowell Observatory conducted a search, which ultimately led to Clyde Tombaugh's discovery of Pluto in 1930. Pluto was, however, found to be too small to have disrupted the orbits of the outer planets, and its discovery was therefore coincidental. Like Ceres, it was initially considered to be a planet, but after the discovery of many other similarly sized objects in its vicinity it was eventually reclassified as a Kuiper Belt object. In 1992, astronomers David Jewitt of the University of Hawaii and Jane Luu of the Massachusetts Institute of Technology discovered 1992 QB1, the first object found beyond Neptune in 62 years. This object proved to be the first of a new population, which came to be known as the Kuiper belt; an icy analogue to the asteroid belt of which such objects as Pluto and Charon were deemed a part. Many of the largest of these objects, such as Chaos, Quaoar, Varuna and Ixion, where discovered by astronomer Mike Brown. In 2005, Mike Brown announced the discovery of Eris, a Scattered disc object larger than Pluto and the largest object discovered in the solar system since Neptune. Solar system observations by spacecraft. 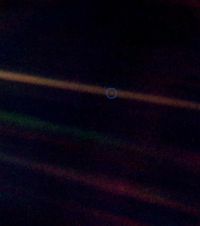 The Pale Blue Dot photo, a photo of Earth as a tiny dot (taken 4 billion miles from Earth by Voyager 1 at the edge of the solar system). 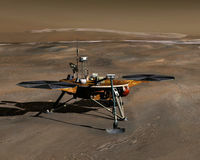 The planned Phoenix Mars lander. Since the start of the space age, a great deal of exploration has been performed by Unmanned space missions that have been organized and executed by various space agencies. The first probe to land on another solar system body was the Soviet Union's Luna 2 probe, which impacted on the Moon in 1959. Since then, increasingly distant planets have been reached, with probes landing on Venus in 1965, Mars in 1976, the asteroid 433 Eros in 2001, and Saturn's moon Titan in 2005. Spacecraft have also made close approaches to other planets: Mariner 10 passed Mercury in 1973. The first probe to explore the outer planets was Pioneer 10, which flew by Jupiter in 1973. Pioneer 11 was the first to visit Saturn, in 1979. The Voyager probes performed a grand tour of the outer planets following their launch in 1977, with both probes passing Jupiter in 1979 and Saturn in 1980 - 1981. Voyager 2 then went on to make close approaches to Uranus in 1986 and Neptune in 1989. The Voyager probes are now far beyond Neptune's orbit, and astronomers anticipate that they will encounter the Heliopause which defines the outer edge of the solar system in the next few years. All planets in the solar system have now been visited to varying degrees by spacecraft launched from Earth, the last being Neptune in 1989. Through these unmanned missions, humans have been able to get close-up photographs of all of the planets and, in the case of landers, perform tests of the soils and atmospheres of some. No Kuiper Belt object has been visited by a man-made spacecraft. Launched in 19 January 2006, the New Horizons is currently enroute to becoming the first man-made spacecraft to explore this area. This unmanned mission is scheduled to fly by Pluto in July 2015. Should it prove feasible, the mission will then be extended to observe a number of other Kuiper belt objects. More About The Solar System. Nov 28, 2005 - The Solar and Heliospheric Observatory (SOHO) is celebrating its 10th anniversary of operations on December 2nd, 2005. Over the course of these 10 years, SOHO has revealed the nature of the Sun's atmosphere, the links between its magnetic fields and coronal mass ejections, and even discovered more than 1,000 comets. Scientists even figured out how to use SOHO to probe the far side of the Sun. Amazingly Sharp Image of a Sunspot. Oct 6, 2005 - This amazing image is of a sunspot three times the size of the Earth. The photograph was taken using the National Science Foundation's Dunn Solar Telescope at Sunspot, NM, which was recently upgraded with an adaptive optics system. The Dunn telescope has a flexible mirror which can be deformed 130 times a second to compensate for atmospheric distortion. This image was made with 80 individual photographs combined together. Are We Near the Solar Minimum? 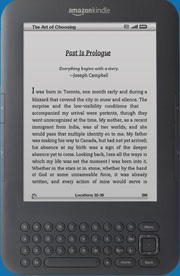 It Looks Like the Solar Max. Sep 16, 2005 - We should be near the beginning of the Sun's solar minimum period; the point on its 11-year cycle when there's usually very little activity on its surface. Well, someone should have informed the Sun, because it's as active now as it can be during its solar maximum. Sunspot numbers have been declining as predicted, but this hasn't decreased the number of solar flares and coronal mass ejections. So, what's going on? Astronomers don't really know. Unfortunately we've only got about 25 years of satellite data to look back at to see the patterns. Aug 17, 2005 - When astronauts will be spending more time in space, it'll be helpful to know when there'll be clear "space weather", to minimize their exposure to dangerous amounts of radiation. NASA scientists have developed a better understanding of the underlying causes of solar flares, and think they can now predict times for "clear skies". Areas likely to explode as flares happen when magnetic fields of different alignments merge together on the Sun's surface. Electrical currents must then build up for several hours before a flare erupts. Sun Was Shining Early On. Aug 12, 2005 - New research from the University of California, San Diego suggests that the cloud of gas and dust that would eventually turn into the Sun was already hot and glowing. The ultraviolet radiation blazing off this protosun played a big part in chemically shaping the early Solar System, including many of the organic compounds that make up life on Earth. The scientists detected it by finding evidence of high-energy solar wind in ancient meteorites. Cluster and SOHO Analyze a Solar Storm. Aug 3, 2005 - Astronomers with the European Space Agency have watched the entire lifecycle of a solar storm using the SOHO and Cluster spacecraft. SOHO detected a large solar flare on the Sun, and then the resulting coronal mass ejection passed the Earth and the 4 Cluster spacecraft. Scientists have speculated that these ejections change shape as they travel from the Sun to the Earth, but the Cluster spacecraft found just the opposite, that its magnetic field stayed the same for the journey. Stars Have More Neon Than Previously Believed. Jul 28, 2005 - Take your estimate for the amount of neon in a star, and triple it. At least, that's what a team of astronomers using the Chandra X-Ray Observatory have concluded. They performed a detailed survey of 21 nearby sun-like stars within a distance of 400 light-years from Earth, and found they all contained an average of 3X the neon traditionally predicted for our Sun. Neon is difficult to find in stars because it doesn't give off any light in the visible spectrum. But when heated to millions of degrees, for example, in a star, this elusive element blazes in the X-ray spectrum. Powerful Flare Shook Up Our Understanding of the Sun. May 24, 2005 - One of the most intense bursts of solar radiation in more than 50 years happened in mid-January this year, and scientists are still mulling over the implications for current space weather theories. Another interesting aspect of this flare is how quickly it traveled through the solar system. Normally a proton shower associated with a flare takes several hours to reach the Earth, but we were hit with the first particles in just 15 minutes. This could have important implications for future space weather warning systems, to keep astronauts safe from solar storms. Solar Astronomers Getting Better at Predicting Solar Wind. May 20, 2005 - Researchers have discovered that the structure of the Sun's lower atmosphere, or chromosphere, can be used to predict the speed and intensity of solar winds - the stream of electrified gas constantly blowing off the Sun. This was unexpected, because the solar wind comes from the corona, or outer layer, while the chromosphere is much deeper into the Sun. By learning how to predict the strength and speed of the solar wind, scientists will be able to protect electrical equipment, satellites and space explorers. Smallest Ever Coronal Mass Ejection. May 11, 2005 - Usually it's the biggest things that get the news, but an international team of researchers have demonstrated that the tiny might be just as important. They spotted the smallest coronal mass ejection (CME) ever seen on the surface of the Sun, produced from a region not much bigger than the Earth. This sounds big, but it's a fraction of the size of those huge CMEs we normally see in pictures of the Sun. Amazingly, the magnetic field lines in this pint-sized CME were 10x more twisted than their larger cousins. Solar Minimum Doesn't Mean a Calm Sun. May 6, 2005 - Our star goes through an 11-year cycle of solar activity. At the recent height of the cycle, the Sun blasted off some of the most powerful flares and coronal mass ejections ever seen. And during the minimum, due in 2006, it's supposed to be calm, right? Well, not exactly. Even during the lowest point of solar activity, the Sun still blasts off a few of the most powerful X-class flares. Unprotected astronauts caught in the radiation would probably get pretty sick. Solar Wind Flows From Magnetic Funnels on the Sun. Apr 22, 2005 - New observations from the Solar and Heliospheric Observatory (SOHO) has helped solar astronomers trace the source of the Sun's solar wind. The solar wind is a constant stream of protons, alpha particles, heavy ions and electrons flowing from the Sun. The solar wind had been seen streaming from various regions on the Sun, but scientists have now been able to work out the structure of funnel-shaped magnetic fields that carry material from below the surface of the Sun, and eject it into space. Most Active Sun in 8,000 Years. Oct 28, 2004 - The Sun is more active today than it has been in 8,000 years, according to new research from the Max Planck Institute. Researchers discovered that a certain isotope of carbon, C-14, depends on the amount of cosmic rays that reach the Earth's surface. When solar activity is high, the Sun's magnetic field provides a shield against these cosmic rays, and when it's low, the Sun lets more cosmic rays reach the Earth. By measuring C-14 levels in dead trees which were buried in the ground, the scientists were able to build up a historic record of solar activity. Scientists have found that solar activity levels only slightly influence the Earth's climate and global temperature. Oct 18, 2004 - On October 11, solar astronomers saw something they haven't seen on the Sun in six years... nothing. Not a single sunspot. Within a couple of days, of course, a sunspot popped up, and they're on the Sun right now. This is a clear indication to astronomers that the Sun is on its way to the low point of its 11-year cycle of activity, called the "solar minimum". During the solar minimum, the Sun can be without spots for days or even weeks, and solar flares subside. Astronauts will breath a sigh of relief; it's a safer time to be out in space. Sep 2, 2004 - A mystery that has puzzled astronomers for years is: why does the Sun's temperature rise as you get further away from it? While the surface of the Sun might only be 6000 degrees Celsius, the corona which surrounds it can be 2 million degrees. The "wave heating" theory proposes that the Sun's magnetic field carries waves of heat from the surface of the Sun and dumps them into the corona. Another theory proposes that lines in the Sun's magnetic field get twisted up and eventually snap, releasing a tremendous amount of energy into the corona. Plasma Jets on the Sun Explained. Jul 29, 2004 - Scientists from Lockheed Martin and the University of Sheffield believe they've solved the mystery of supersonic jets that dart across the low atmosphere of the Sun. The team used computer modeling and high-resolution images taken with the Swedish 1-metre Solar Telescope to understand how these jets - called "spicules" - are formed. They noticed that the spicules formed in certain spots quite regularly, usually every five minutes or so. This matched sound waves on the Sun's surface that had the same five minute period. The sound waves are usually dampened before they reach the Sun's atmosphere, but wherever they aren't dampened, spicules are formed, propelling matter upward. Jul 23, 2004 - Using data gathered by NASA's SORCE satellite, scientists noticed that the light from the Sun reaching the Earth decreased by 0.1% during the Venus transit earlier this year. This is similar to what happens when large sunspots obscure the face of the Sun. In October 2003, three large sunspot groups moving across the Sun dimmed it by 0.3%. These large sunspots are surrounded by bright areas called "faculae", which actually compensate for the dimmer spots, and provide a net increase in sunlight when measured over a period of a few weeks. Solar Blast Reaches the Outer Solar System. Jul 9, 2004 - The twin Voyager spacecraft, located at the edge of the solar system, have detected the effects of the most powerful solar storm ever detected, that blasted off the Sun in October/November, 2003. Thanks to a fleet of spacecraft, including Cassini, Mars Odyssey and the Voyagers, NASA scientists have been able to get a comprehensive view of how storms travel across the solar system. They hope that when the storm crashes into interstellar gas in a few more months, it will emanate radio waves detectable here on Earth. 3D View of a Coronal Mass Ejection. Jul 2, 2004 - Scientists have used data from the SOHO spacecraft to build a 3D view of Coronal Mass Ejections (CMEs). CMEs are the most powerful explosions in the Solar System, and scientists believe they're caused when magnetic lines on the Sun get so tangled they "snap" back into position. This throws out millions of tones of electrified gas - sometimes directly towards the Earth, causing disruptions and beautiful auroras. The team viewed CMEs with SOHO, and found that the electrical field changed the light so that the 3D structure could be rebuilt on a computer. Our Sun is Anything But Boring. Apr 30, 2004 - The light from the Sun seems regular and steady, but research from the University of Southern California paints a different portrait of a dynamic and chaotic star that experiences a range of events. Small forces acting deep inside the Sun can lead to significant changes on its surface, causing the flares and coronal mass ejections that can strike the Earth. Scientists are still trying to understand if there's a connection to the Sun's 11-year cycle of sunspots and temperature changes on the Earth. Links For The Solar System And Solar Astronomy. National Geophysical Data Center - Data archives for numerous space weather databases, including solar, geomagnetic, ionospheric, and cosmic ray station data. National Solar Observatory - Get your pictures of the sun here! Solar Storm Monitor - The dynamics of the Sun, solar storms, and solar wind with real-time solar storm satellite data.